LTHForum.com - Share pics of your pepper mill! Share pics of your pepper mill! 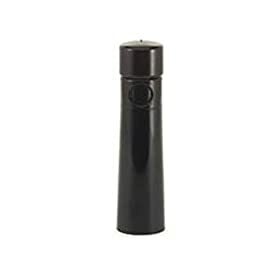 LTH Home > Chat > Shopping & Cooking > Share pics of your pepper mill! I have the Unicorn Magnum Plus pepper mill. This thing will grind a mountain of pepper in no time flat. Thank you, irisarbor and trs23 for your suggestions. I was hesitant to spend more than $20 because Mama happy_stomach has a long history of breaking gadgets which I then replace for her. Overwhelmed by the shopping crowds yesterday, I settled on a manual mill with a turn-top that should at least be easier to use than her current squeeze mill. I thought Mama happy_stomach would also be amused by the one I chose because it's made my Trudeau, the Montreal company, that shares a name with her favorite prime minister. we also have a magnum pepper mill (although not the plus). The thing is damn near indestructible and grinds a ton of pepper very quickly. Jamieson22 wrote: I have the Peugeot Fidji 8" Salt and Pepper grinders. I like them quite a bit. They adjust grind by loosening the ball on top, and hold quite a bit. The salt grinder kinda sucked when I was using Maldon Rock Salt, but works as it should now that I am using Baleine coarse sea salt crystals. No idea why as they look and feel fairly similar. I just received a Peugeot pepper grinder as a gift. I read the little manual which indicated if you turn the handle in clockwise you have a coarse grind. If you turn the handle in the counterclockwise, you get a fine grind. I then tried another grinder, which I called a one grind wonder, by turning the handle one way or another it changed the grind. I don't know if this is a regular feature on grinders I missed or it happens these two have it. I thought you might want to know to at least check out for yourself. I have the one second from the left shown by Grizzly. It works well. You have to take the cap off but it does stop pepper from landing on the counter. I also have an Old Thompson mill that I had for years that finally broke. I heard you can get them fixed. I am going to look into this. I am very attached to this particular pepper mill. I do not use pepper other than freshly ground. I love the smell of it. Love it on salads and pasta particularly. Here is info from their site. In the market for a new mill. All the standard review sites (Wirecutter, Cooks, Serious Eats, etc...) do not align on their favorites. Peugeot look great but many on amazon complain about them breaking 2 months into owning them. I have historically had the Unicorn Magnum which I had great success with but realized after reading more on these that it doesn't in fact get to a very fine grind. Never had been an issue before but not sure I had thought about it. May end up with it again but thought I would poll the audience to see if you all have any strong opinions. We have three pepper mills. The first is an old one from Crate & Barrel. I like it best for coarse grind. I don't know the provenance of the second -- my husband brought it into the marriage. The third is from Fletcher Mills, purchased at the Spice House, which we like a lot. I have a few of these . . .
. . . and I think they're great. I've purchased them at The Spice House and Amazon. Edited to add: The reason I've purchased multiples is because I have one for black pepper, one for white pepper, one for cumin, etc. I've never needed to replace one for any reason. jpeac2 wrote: Peugeot look great but many on amazon complain about them breaking 2 months into owning them. Near the stove, I keep the Peugeot Saint Malo, because it just puts out a lot of pepper. I adjust the grind with the knob on the top. On the dinner table, I have a grinder looking very similar to the Peugeot Paris Classic. Just recently, I noticed I could control the grind by rotating the bottom edge marked with Roman numeral markings. When I have go out and about, I have pepper mill bought at a rummage sale made on the "Third rock from the sun." At a glance, I can tell if I am running out of peppercorns. When it is home, I put white pepper in it. I also have an allspice mill. 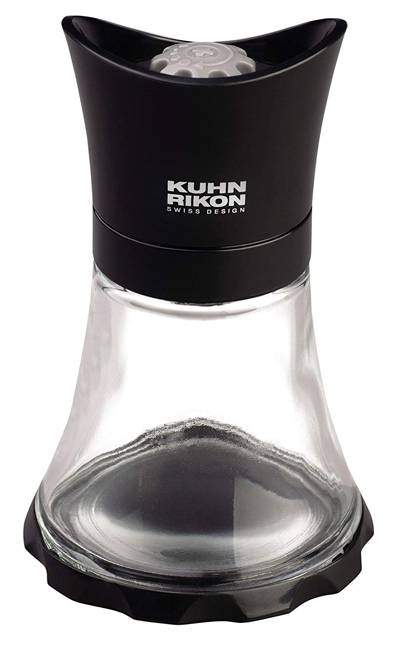 It's clear, so at a glance anyone should figure out it is not your Mama's pepper grinder. It just stays in the kitchen with me, so far nobody has pulled it off the shelf but me. I am waiting for the day when I get a puzzled look. I inherited a chocolate mill. Again, it is clear with stuff that just doesn't look like pepper. In a clear cap, there are cocoa beans. It is more a curiosity than really used, but perhaps someday. When I need to do volume, I rely on my electric coffee grinder that has never touched any coffee beans. That's my happy family of grinders.